Bruce Lee was a Chinese American martial artist and actor who is widely regarded as the most influential martial artist of the 20th century. 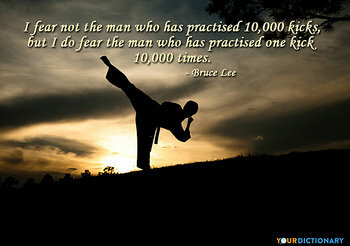 I fear not the man who has practised 10,000 kicks, but I do fear the man who has practised one kick 10,000 times. 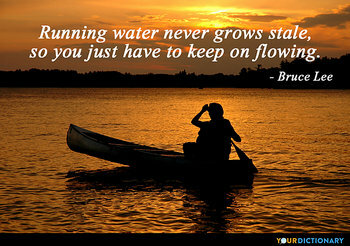 Running water never grows stale. So you just have to "keep on flowing."  The Warrior Within: The Philosophies of Bruce Lee (1996, pg. 48). An instructor should exemplify the things he seeks to teach. It will be of great advantage if you yourself can do all you ask of your students and more.  Part 5 "On training in Jeet Kune Do"
Don't think, feel ....it is like a finger pointing a way to the moon. Don't concentrate on the finger or you will miss all that heavenly glory!  Bruce Lee: Enter the Dragon (1973); In a training session with one of the temple students. Take inventory of everyone with whom you have contact. Reality is apparent when one ceases to compare. There is "what is" only when there is no comparison at all, and to live with what is, is to be peaceful. Nowadays you don't go around on the street kicking people, punching people because if you do (makes gun shape with hand), well that's it I don't care how good you are.  As "Mr. Lee" in Enter the Dragon (1973); Bruce Lee's character said this to "Oharra" after Oharra had broken a board in the air with his fist. Meaning is found in relationship. Meaning is the relationship of the foreground figure to the background. You cannot force the Now. But can you neither condemn nor justify and yet be extraordinarily alive as you walk on? You can never invite the wind, but you must leave the window open. To contemplate a thing implies maintaining oneself OUTSIDE it, resolved to keep a distance between it and ourselves. Possession of anything begins in the mind. The timeless moment. The "moment" has no yesterday or tomorrow. It is not the result of thought and therefore has no time.